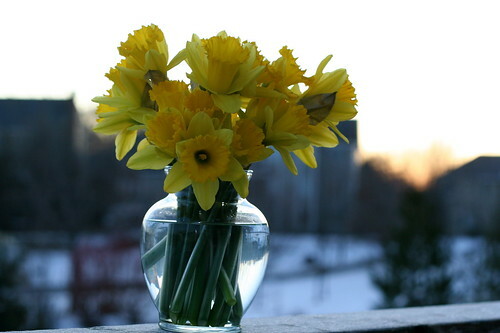 Aren't those daffodils in front of a clear sunrise just the most cheerful thing you ever saw? Well, maybe it would have been slightly more cheerful if they had been poking their happy little heads out of the soil, but you take what you can get at this point in the winter. And for $4 at Cub, I was tickled yellow to pick up a big bouquet of sunshine. It was just the pick-me-up we needed around the house after 2 weeks of sickness. First it was me with Strep throat, barely three days later Bella had stomach flu, then Brent got it the next morning, then Bella got it again, then I got it at the same time, then I got influenza. Do I sound like an old person with too many ailments yet? I also made a can of green beans and discovered Bella eats canned green beans with great gusto. She crams them in her mouth with both fists and they poke out from the sides of her mouth as she tries to say MORE GREENBEANS. "No more green beans until you try a bite of mashed potatoes." Huh. Never thought I'd need to say that. After dinner I was so tuckered out, what with the Cub trip and then sitting up to eat food. So we put Bella to bed and flopped down on the couch, lamenting that there's no good TV anymore, (because how many In Treatments can you really watch in one week?) when, like a heavenly satellite beam being directed straight into our TV, Top Chef appeared. Oh glorious day! And next Monday starts Dancing with the Stars, normally one of my main reasons for ridiculing co-workers and parents, but which I am watching this year because it includes Adam Carolla. So I am excited for a couple months of high-quality TV entertainment. Last year at this time, I can't hardly believe it, but we were buying and assembling deck furniture. This morning our deck still had a big cake of snow on it, so I guess I don't have to worry about TV watching conflicting with decksitting, which can sometimes be a couch-potato's worst nightmare. Come to think of it, maybe a couch potato's worst nightmare is a 2.5 lb to-go container full of its mashed brothers. Yum.